Carers Japan aims to build a society where all people can live in harmony by (1) bringing together carers, people who care about carers, and people who are willing to work at a societal level on challenges facing carers, (2) connecting different care systems that are fragmented by illness and disability, and (3) promoting the reform for social security that leverages compassion and solidarity of citizens. 1. People who need care and their carers should both be recognized and respected. 2. Services and support should be developed and promoted to ensure the environment where people can continue to provide care without too much stress or burden on their mental and physical health. 3. Carers should be able to continue to participate in society without having to give up their education, jobs, hobbies or other activities because of their caring responsibilities. 4. Public awareness should be raised so that carers can be better recognized and understood and their experiences can be more appreciated in policymaking. In our society, there are people who need care in their daily living. They include people with disabilities, those with illness or injury, older people who need support and others. Meanwhile, there are also people who provide care to these people, living with physical, mental and financial insecurity but without future prospects. Among those providing care (carers) are children and young people. There are also carers who have other family and work responsibilities. Some carers are retirees who could have enjoyed their own time, while others are very old and can barely manage their own personal care. Some carers are forced to leave their jobs or give up their educational opportunities due to caring responsibilities. If care forces carers to sacrifice their own lives, present and future, would you call it “good care”? Would people who need care want their carers to make sacrifices for themselves? We all have the right, as individuals with dignity, to decide how to live our own lives. We should change our society that has long put a burden on carers in all aspects, including physical, mental and financial ones. We can connect different care systems that are fragmented by illness and disability. We can hold hands as “carers” by bringing together carers, friends and neighbors who care about carers and want to do something to help them, citizens who are willing to work at a societal level on challenges facing carers, as well as experts in the field. These efforts should not only support the current carers but also give hope to everyone who may become a carer sometime in the future. We hereby declare the establishment of Carers Japan, aiming to build a society where people who need care and their carers can all enjoy and fulfill their own lives. Establishment of Carers (unpaid carers such as families) Japan. 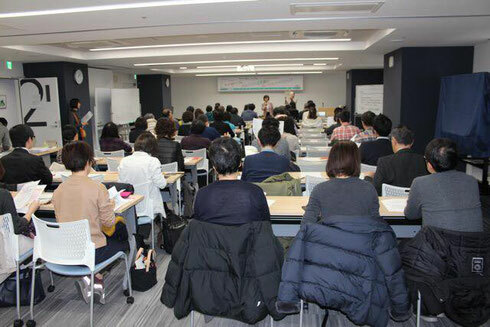 Establishment of Carers Japan (General Incorporated Association).